In case you didn’t know, the multi award-winning Cape Town Company, Isango Ensemble returns to London for a four week season at Hackney Empire and will be there until 3, June 2012. The Hackney Empire, supported by the Columbia Foundation Fund of the London Community Foundation, will present Aesop’s Fables, The Ragged Trousered Philanthropists and La Bohème. Isango’s Aesop’s Fables is a vibrant and powerful musical by Mandisi Dyantyis and Pauline Malefane with a script by Peter Terson. Although Aesop is portrayed as a Greek the production is set within the recent history of South Africa. Aesop was historically a slave and in Peter Terson’s script he ‘learns that liberty comes with responsibility’ as he journeys toMountOlympus meeting his animal characters on the way. Hackney Empire and Eric Abraham present The Isango Ensemble production of Aesop’s Fables is adapted and directed by Mark Dornford-May with music by Pauline Malefane and Mandisi Dyantyis, with choreography by Lungelo Ngamlana. The Ragged Trousered Philanthropists musical adaptation by Stephen Lowe of Robert Tressell’s seminal work opened The Fugard Theatre in Cape Town in 2010. 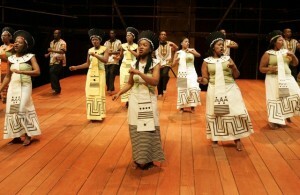 Isango Ensemble was the company in residence for the first year. The book is one of the most influential twentieth century socialist novels. Robert Tressell spent much of his early life in Cape Town and the novel bears hidden traces of his life in the then Cape colony. Isango’s version moves the action to an apartheid era 1950s Cape Town with popular and Struggle songs from that time. The Ragged Trousered Philanthropists directed by Mark Dornford-May with music by Pauline Malefane and Mandisi Dyantyis. Isango’s version of La Bohème will transfer the story from the garrets of Paris to the townships of South Africa. The music will be played on Marimbas and Steel Pans in a style similar to the company’s Olivier Award-winning The Magic Flute which was seen at the Young Vic in 2007 and the Duke of York’s Theatre in 2008. The townships where the performers come from are among some of the world’s highest infection areas for Tuberculosis. In the company’s extended families many are living with the realities of TB on a daily basis. La Bohème is also adapted and directed by Mark Dornford-May, music directors are Pauline Malefane and Mandisi Dyantyis, and words by Peter Cann and Isango Ensemble. This entry was posted on Monday, May 14th, 2012 at 4:31 am	and is filed under Africa, African Diaspora, Art and Culture. You can follow any responses to this entry through the RSS 2.0 feed. You can leave a response, or trackback from your own site.